Acute myeloid leukemia (AML) represents a heterogenous group of disorders that are characterized by peripheral blood and bone marrow myeloblast proliferations that will kill the patient in weeks or months if untreated . They show variable response to therapy, and some types are best treated by hematopoietic cell transplantation, while other types may be eligible for more targeted therapy. The 2016 World Health Organization (WHO) classification of acute myeloid leukemia includes a number of categories and many subtypes . Most of these subtypes have distinctive morphologic features, which are illustrated in this chapter, but the complete diagnosis relies on correlation between morphology, immunophenotypic, cytogenetic, and molecular genetic studies. Although the detection of Auer rods—cytoplasmic granules that aggregate to form rod-shaped cytoplasmic inclusions—is specific for myeloid lineage, they are not present in many cases, and immunophenotyping is now routine in all cases of suspected acute leukemia. Cytochemical studies may also be useful but have been largely supplanted by flow cytometry immunophenotyping. 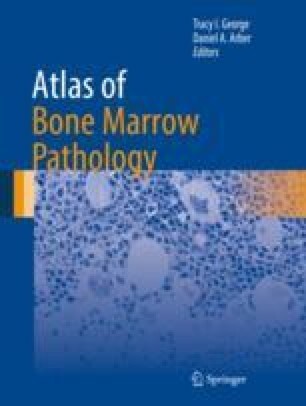 While this chapter focuses on the morphology of the bone marrow in AML, correlation with peripheral blood findings is also essential, and some cases may have more myeloblasts in the blood than in the marrow; such cases may be diagnosed as AML based solely on the peripheral blood blast cell count.